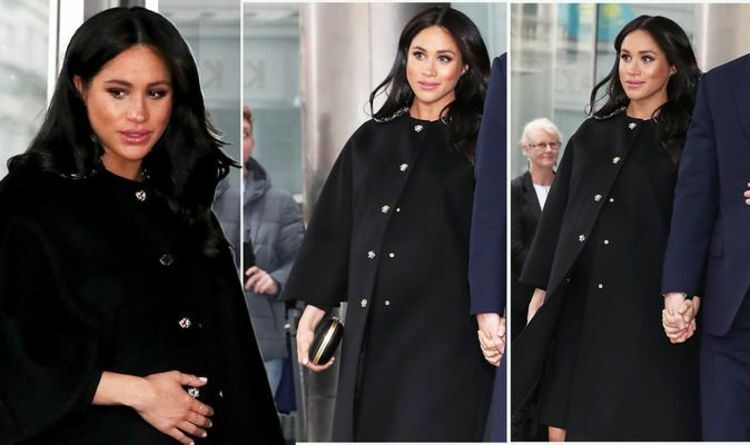 Meghan Markle wore a black coat with matching shoes as she stepped out with Harry to pay tribute to the victims of the shooting in Christchurch. She wore a pair of black stilettos that were the Aquazzura Savoy 105 Black Suede Pumps that are currently on sale for £572. The Duchess marked her respect for the victims in New Zealand by wearing a black swing coat which features large buttons that she had fastened up. The oversized coat featured wide black sleeves and jewelled collar to appear at the unannounced visit. Underneath her coat which was buttoned up, a glimpse of a black dress could be seen. She held onto a black satin clutch bag that fastened with a gold clutch. In her other hand, Meghan held onto a small bunch of flowers as she went out in London. The former suits star kept her make-up simple with a slick of bronzer and pink lip gloss. Her hair was blow-dried into a loose curl and she entered the event with Harry. Meghan carried a designer bag worth £1,695 to Zara Tindall’s christening for baby Lena. She carried the pricey new bag for the christening at the weekend. The Royal Family attended church for the event, including the Queen. She wore a maroon vintage swing coat that fit over the baby bump. The Duchess also wore a navy velvet beret, which was a bespoke piece from Stephen Jones.